Listen to your iPod / MP3 player on your car or home stereo. The MU3MMMSWH 3m White 3.5mm Slim Audio Cable features male to male 3.5mm connectors, enabling you to connect your portable 3.5mm mini jack audio devices (iPod, iPhone, iPad, MP3 player, etc.) 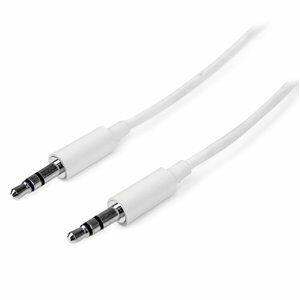 to your car or home stereo system.Featuring a slim connector molding, this aux stereo cable fits nicely into a 3.5mm headphone jack, even if your mobile audio player is in a protective case.